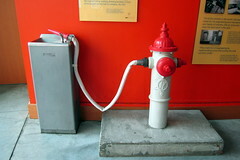 The intellectual experience of the Big Berks is like drinking from a firehose, except without the phallic imagery. Now that I’m home and mostly-recovered from the Big Berks, I’ll just say: one of the best conference experiences I’ve ever had. (And, certainly, the only one with a Saturday night dance.) For now, read recaps of the event by Tenured Radical, Knitting Clio, and Another Damn Medievalist. If you attended, you should also take the opportunity to send your own comments in for publication at the Berks website. I’ll post further recaps of my conference tweets later this week, as I get to it, but today I’m thinking about the theme of the conference: “Generations: Exploring Race, Sexuality, and Labor Across Time and Space.” Attending the business meeting on Sunday afternoon has left me with a few thoughts on generations– feminist, internet, and otherwise. I totally understand the historical importance of women’s organizations in helping women to navigate institutional sexism in the professions– I wouldn’t be in graduate school now if it weren’t for having graduated from Smith. I think mentoring is really important, especially for people from groups who’ve been historically excluded from academia, and I want to support that work. So, at the risk of being the noisy d00d in a roomful of women, I showed up. What I learned was really interesting. I don’t want to reveal anything that’s not general knowledge, but I think that those of us contemplating the future of scholarly societies on the internet sometimes speak without enough specificity about actual existing scholarly societies. The conference did surprisingly well, financially. Despite the ugly state of the economy, over 1400 attendees registered– up about 20% from the last conference, held in 2008. The Little Berks also had a nice membership boomlet, which is typical for the year of the conference– as I remember, membership went up from the low 300s to the high 300s, about 20%. In other words, the Berks is the rare scholarly conference and society that’s doing well in this economy. That’s probably because it has a reputation for being the place for women’s history scholars to find good networking and mentoring. As far as I can tell, that reputation is well-deserved. At this conference more than others, I had some great conversations with scholars who’ve been around the block. I think I’ve finally begun to understand why many aren’t comfortable with the era of online open peer review and other novel scholarly fashions, but that’s probably food for another post. In the meantime, I’ve been thinking a lot about what I’d do to bring the Berks more fully into the era of the DIY internet-based scholarly society. The scholarly-society website: what should it do? Some of this is a problem of infrastructure: the conference registration was done by UMass conference services, the paper-submission system was done by an outside vendor, and the organization’s website is separate from the 2011 conference blog. That’s 4 separate systems, and everyone involved agreed that this needs not to happen again. One of the chief things I noticed– in this business meeting, but I’ve also noticed it in other organizations– was that there’s still a real tension between making an organization website where the “leadership” communicates with the “members,” and the peer-to-peer, anarchically organized online social networks some of us use professionally. On one hand, one wants the organization to look “professional” and “authoritative,” with an editorial vetting process for all website content. On the other, an unchanging website for the organization means that people don’t visit regularly or participate in the few interactive sections of the site. On the third hand, isn’t peer-to-peer connection and breaking down hierarchies part of what intersectional feminisms (in their best incarnations) ought to do? While the organization sorts these things out– which will take years– this means that the History Carnival, its Twitter-collected spinoff The Broadside, and the rest of the women’s-history blogosphere play more of a day-to-day role in many Berks members’ intellectual lives than does the Berks organization. Is that desirable? I don’t know, but it does open the question of how the organization will function in the future. I don’t think the Berks’s web situation is is a matter of throwing good money after bad, any more than it is at the AHA. Changing an established organization, especially in academia, is like steering a cargo tanker: it takes a long time and it’s harder than you’d expect, but you do have to know where you want to go first. Here’s an example of what a small (or large) scholarly society could be doing online, and to my knowledge no historians’ organization yet does it systematically. One of my best conference experiences was the Sunday morning workshop session. The AHA may have recently suspended precirculated-paper sessions because no one reads the papers, but they’re alive and well at the Berks. Presenters posted their papers online at the UMass ScholarWorks site, which made it possible for me to download them and read them as I was sitting in the workshop (mine was “Historicizing the Troubled Womb.”) I had a real experience of the conference’s intellectual heft as I contemplated 8-10 concurrent paper-workshopping sessions, each one running 3 hours and containing 4-8 papers. I loved the chance to drop in on 6 very smart people workshopping their current projects and taking questions from the other participants. The same openness which made that session great may be perceived as a weakness by some. There was no way for the organizers to protect workshop papers from general viewing– no restricted logins only for conference registrants. Since all the papers were works-in-progress designed for a specific event, their authors presumably wouldn’t want them floating around. Now that the conference is over, those papers have been taken offline– which is a pity, since I totally would have spread the word about several papers I heard. Since returning home, I’ve also experienced a related annoyance. Berks is one of those conferences where everything is cross-scheduled with everything else– which is wonderful. Every time I met someone who wanted to know about my roundtable presentation but couldn’t attend to hear it, I told them that I was planning to put it online after the conference. The fact that Berks doesn’t have this isn’t a failure of the organization. It’s a sign that we don’t yet have common, DIY-easy practices for scholarly infrastructure online. Someone who develops a good how-to on running a real-world physical conference, with housing and a budget and a paper-submissions-and-review system, using DIY-style open source tools, will be doing the scholarly world a great service. There’s a need here. Someone, please step in and fill it. And, if it exists already, please tell the Berks 2014 organizers— or, better yet, jump in and help them. I concur that we should aim for a more integrated website for 2014. Even if conference registration needs to be handed off to a secured financial provider that the venue uses, we can have a depository for papers, a forum for registered users (parts not visible to the public if desired) and integrate a Twitter stream or whatever else in new social media crops up before then! Drupal might be a workable base from which to start. As it’s open source and modular, you can easily accommodate these kinds of needs. Plus, I’m pretty sure they’re the behind-the-scenes architecture I’ve seen for a number of professional organizations!